Coined the “opioid epidemic,” the United States’ public health crisis of rising opioid-related overdoses and overdose deaths has finally garnered medical, social, and political attention and focus. In October of 2017, President Trump declared the opioid crisis a “public health emergency,” potentially paving the way for more national resources to be allocated to opioid-related treatment and research (Davis, 2017). Some states have been affected more than others by the epidemic, although all of them have at least 2.4 opioid-related overdose deaths per 100,000 people per year (NIDA, 2018). Ohio ranks third in states with most of these overdose deaths and has 36.8 such deaths per 100,000 people (Columbus Public Health, 2018). Franklin county, Ohio’s second most populous county, has seen its rate of unintentional drug overdose deaths rise by 423% since 2003 (Columbus Public Health, 2018). While more research studies are underway and are being funded as the crisis continues, more work is needed to answer basic questions. What are best practice guidelines for delivering treatment to those with Opioid Use Disorder (OUD)? How can opioid users be effectively linked to treatment during a crisis? How can users avoid relapse or further need for intensive treatment? At the center of each of these questions is the individual “OUD treatment experience.” Even critics of the government’s handling of drug epidemics, past and present, see the need for treatment as a vital focus moving forward (Stobbe, 2017). It appears the nation is primed for a great influx of addiction treatment centers to treat the rise in drastic number of Americans dying of opioid-related overdoses. However, the data show a low level of engagement among opioid users with treatment centers. In 2016, only 18% among those needing treatment for an illicit drug use problem received treatment at a specialized facility (Park-Lee, Lipari, Hedden, Copello, & Kroutil, 2016). With such a low treatment engagement level, it is essential that addiction treatment leaders prioritize quality for both staff and clients. This may or may not dictate a surge in new treatment center construction but does impact the quality of treatment offered during treatment interventions. Focusing on the healthcare providers specifically, like counselors, social workers, or nurses, treatment center staff encounter a breadth of occupational stressors: resistance from clients, poor treatment outcomes, coworker turnover, and pressure to meet company goals. In addition to these barriers, which several other professions could reasonably face, addiction treatment center providers are confronted with overwhelming client workloads, emotional stories of loss and devastation, and the uncertainty of final outcomes of treatment (Volker et al., 2010). Healthcare providers, specifically addiction treatment providers, may thus face a higher risk of burnout compared to other professions. Burnout is broadly defined as the interaction of the stresses of work and the ways in which a person copes or, more accurately, fails to cope (Lacoursiere, 2001). As the pressures and stressful experience of a job increase, the employee may begin to feel burnt out as their coping skills deteriorate. According to Maslach (2001), a leading figure of job burnout research and developer of a popular burnout instrument, the burnout experience can be deconstructed into three dimensions:  overwhelming exhaustion,  feelings of cynicism and detachment from the job,  and a sense of ineffectiveness and lack of accomplishment (p. 160). We can imagine how an opioid use counselor may experience each of these facets. If the counselor has more clients than hours in the workday, he/she could easily become exhausted. Counseling multiple clients that may have been through treatment multiple times could lead to cynicism about the effectiveness or benefits of treatment. Finally, when counselors experience a lack of closure as clients leave the center and are never heard from, accomplishments are difficult to conceptualize. Job burnout as a conceptual model and theory has been driven predominantly by Leiter and Maslach (1999). While incorporating the basic three-dimension framework of exhaustion, cynicism, and ineffectiveness, the authors expanded their theory to include the organizational, contextual, or environmental aspects of burnout. Burnout aside, substance use treatment centers face a breadth of unique challenges, at both the individual provider and organizational levels. As discussed, the personal stress counselors face can be formidable, much like that of other healthcare delivery workers (Oser, Biebel, Pullen, & Harp, 2013). Outside of the individual effects of this profession, characterized as “compassion fatigue” though recent literature suggests discontinuing the term (Biebel, 2012), are organizational factors. In order to stimulate research that could lead to improving the national substance use treatment network, D’Aunno (2006) briefly summarized the current state of organization and management in substance addiction treatment. D’Aunno argued that best practices are commonly not used in substance abuse treatment centers because clients are not in position to demand them. Additionally, and more applicable in this context, since treatment providers often use the practices they prefer or see fit, managers cannot expect for all staff members to adopt a current best practice merely because they show efficacy. Furthermore, D’Aunno described an inherent conflict between substance use counselors and their leadership; counselors desire to use what they believe works best for them individually, while leadership exerts pressured to follow best practices standards and guidelines. This fits in the control area of Leiter and Maslach’s (1999) organizational burnout risk model while also touching on fairness. Counselors and social workers may perceive it unfair that they, the trained professionals who interface with clients, do not get to choose the method or framework implemented during treatment. Similar to the D’Aunno (2006) study, Leiter and Maslach intended to fuel further research in the organizational behavior and leadership of substance use treatment. The longitudinal study utilized data from the National Treatment Center Study at the University of Georgia from public and private sector treatment centers (n = 766). The authors used this data to highlight differences of substance use treatment delivery between public and private sectors. While these findings would no longer be accurate as 12 years have passed, the general pattern of findings may be. In every medically assisted treatment (MAT) the public-sector counselors were more familiar with the effectiveness of the listed treatment. This could be helpful for directors and counseling managers in private sectors who may need to ensure staff are familiar and trained on best practices. Counterintuitive findings showed that private sector treatment centers consistently offered more MAT. During their national study of implementing evidence-based treatment in community addiction treatment providers (excluding specially identified programs in the NIDA Clinical Trial Network (CTN)), Lundgren et al. (2011) analyzed the organizational and leadership factors of directors (n = 212) for correlation with perceived attitudes of their staff’s resistance to organizational change. The authors’ linear regression model found that those directors with less staff cohesion and autonomy who also saw their organization as needing more guidance displayed higher levels of staff resistance to organizational change. The authors recommended that more funds are needed to properly train staff in evidence-based practices, though this may result in unwanted effects in employee burnout regarding control. Additionally, these results may show a need for addiction treatment leaders to strengthen their staff’s cohesion, which will be discussed later with other protective factors. Before considering protective factors against job burnout and how organizations may implement or strengthen them, it is important to understand the factors contributing to this psychological syndrome following Maslach & Leiter (2016). The literature classically established a multitude of individual factors (Pines & Maslach, 1978) and researchers later sought to describe organizational contributors (Leiter & Maslach, 1999). Two of the three dimensions of the burnout experience, exhaustion and cynicism, could be considered solely on the personal level. True, the workplace environment moderates these, but individual feelings of exhaustion and cynicism exist primarily at the individual level. In other words, there can be no tangible workplace expression of exhaustion or depersonalization, whereas with reduced accomplishment there can be, for example, a lack of annual raises or no reinforcement from management. Lacoursiere (2001) suggested that there could be certain work events or environments in which a feeling of burnout might be a normal response. This contrasts with the conceptualization of burnout as a disease-model. Regardless, in response to individuals experiencing unhealthy levels of burnout components like exhaustion or cynicism, Lacoursiere (2001) purports that employers ought to demonstrate the same effort as when dealing with other problems like quality, style and performance levels of work. Corroborating these two primary, individual contributing factors Knudsen, Ducharme, and Roman (2009) applied burnout principals to measure other job-related individual factors. The authors, recognizing a lack of research on emotional exhaustion and turnover intention for organizational leaders, completed research on leaders of addiction treatment organizations and focused on the leader turnover intent and emotional exhaustion. Turnover intention, rather than actual turnover, was chosen since true turnover data requires longitudinal research. The authors used two job demand related independent variables, performance demand and centralization (making more day-to-day decisions), and two job resource related independent variables, innovation in decision-making and long-range strategic planning. The researchers’ hypotheses were mostly confirmed; higher levels of emotional exhaustion were significantly associated with larger turnover intention (p < .001) and the two job demands were also significantly associated with emotional exhaustion (both p < .01). As opposed to reduced accomplishment, the third primary component of burnout, Volker et al. (2010) analyzed job satisfaction in relation to risk of burnout. Job satisfaction could be considered the individual form of the third primary dimension, inefficacy; job satisfaction is parallel in many ways with perceived inefficacy. The researchers gathered treatment provider data from six different opioid treatment centers across Europe: Athens, London, Padua, Stockholm, Zurich, and Essen. The study is part of the larger Treatment-systems Research on European Addiction Treatment study (TREAT). The participants (n = 902) were only required to be health care workers delivering therapy or counseling to primarily opioid users. Participants completed, in addition to other batteries, the Maslach burnout inventory (MBI) and a job satisfaction scale. As mentioned, the MBI covered three constructs: emotional exhaustion, depersonalization, and reduced personal accomplishment. The authors’ regression model, however, only included a subset of persons from Essen, Stockholm, and Zurich (n = 142). Health care workers with low job satisfaction had 13.2 the odds of experiencing burnout compared to those with higher job satisfaction. Opioid treatment providers with high levels of burnout view their work situation as out of their control and try to avoid their negative emotions. In addition to these causes, Kulesza, Hunter, Shearer, and Booth (2017) used provider stigma as a predictor of job satisfaction and burnout. The secondary data analysis tested whether provider stigma predicted three primary outcomes at a community-based addiction treatment facility: job satisfaction, burnout, and workplace climate. The authors argued that previous burnout studies on substance use disorder (SUD) treatment providers were conducted in either medical settings or resource-rich facilities, thus limiting generalizability. A 2014 and 2015 survey of Los Angeles treatment providers at publicly-funded centers (N = 38) were used to measure job satisfaction, workplace climate, burnout, and provider stigma. Using stepwise linear regression, the authors concluded that higher provider stigma was significantly related to lower job satisfaction and low ratings of workplace climate. Burnout, however, did not show evidence of being significantly related to provider stigma. A small sample size likely hindered this study and prevented findings similar to previous studies that significantly associated provider stigma and burnout. Still, the study was helpful in establishing the need to study under-resourced community centers. Hopefully, more longitudinal data can be collected to build off this cross-sectional study. Lacoursiere (2001) linked both increased work pressure and unclear work policies to burnout. Some of these factors, like work pressure, can contribute to the intrapersonal dimensions of burnout. Increased work pressure would seem to accentuate exhaustion but is still considered an organizational factor since work pressure exists on the occupational plane. Further research could explore individual perceptions of organizational factors, e.g. is an individual’s perception of work pressure or unclear policies a stronger predictor of burnout than objectively, measured constructs? The six organizational risk factors as defined by Leiter and Maslach (2018) are workload, control, reward, community, fairness, and values. Employer-employee harmony depends on finding an agreed upon balance within each of these arenas. Conversely, issues arise when there is incongruence between the employee’s expectations and the reality of workplace demands. Leiter and Maslach (2018) conclude that the, “critical point is whether the organizational control systems are consistent with the staff members’ expectations for their work” (p. 473). Maslach and Leiter (2008) later defined this relationship of expectations as job-person incongruity and labeled it as an early warning sign of burnout. Using the AWS and MBI, the authors were able to identify these warning signs clustering within a specific department. Of the six areas of ‘worklife’ proposed by Leiter and Maslach (1999), “fairness” appears to have the least published prior research. According to Maslach and Leiter (2008), “fairness” in burnout research refers to the, “extent to which decisions at work are perceived as being fair and equitable” (p. 500). There is sufficient literature establishing fairness as a critical construct in leadership; employees are less susceptible to burnout when they perceive their leaders as fair (Leiter & Harvie 1997). This leads to an important question: since fairness is both understudied and highly associated with burnout, might there be a leadership framework geared toward increasing fairness that might mediate employee burnout? Recently, this question was addressed by Laschinger and Read (2016) who measured effects of authentic leadership burnout. This seems logical since authentic leadership values ethics, transparency between leaders and followers, and self-awareness (Avolio & Gardner, 2005) and could have protective effects on burnout. Though authentic leadership is young in its formation and study relative to other leadership models (Northouse, 2015), there have been promising results in relation to decreasing employee burnout (Laschinger, Borgogni, Consiglio, & Read, 2015; Laschinger & Read, 2016). Servant leadership, however, has yet to be studied in-depth as a predictor of employee burnout. 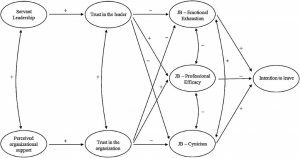 Greenleaf (1970) was the first to present the servant leadership framework as an organizational theory according to the systematic review by Aij and Rapsaniotis (2017). As the name suggests, the central tenet of servant leadership is the desire to first serve others. The secondary desire to lead is seen as a calling that requires the servant leader to put others’ needs and aspirations above their own. The ultimate goal in servant leadership is helping others achieve success which in turn helps the collective efficiency and production of the team (Northouse, 2016). Studying the aspects of servant leadership, it is simple to see parallels of fairness. Research has demonstrated that 1) reducing organization costs and 2) enhancing procedural justice are two tangible outputs of servant leadership (Aij & Rapsaniotis, 2017). Additionally, these outputs would exist within an organizational culture that promotes transparency. Recalling that fairness on the AWS relates to employee perception of work decisions being equitable, effective servant leadership may strengthen employee fairness, perhaps even burnout. Further, counseling lends itself nicely to the tenets of servant leadership. This is important for addiction treatment directors for two reasons. First, treatment center leaders often have a professional background in substance use treatment. If the leaders were successful, perhaps as evidenced by their promotion, then their personality, the key tool in servant leadership (Aij & Raspaniotis, 2017), would be well-suited for servant leadership. Thus, counselors who may eventually be in leadership positions should consider the servant leadership model. Second, counselors and other staff may respond more positively to servant leadership compared to other less personal leadership styles. If a key concept of servant leadership is to, “inspire followers to achieve their own goals and meet the organization’s objectives,” then the leader’s model parallels the counselor’s clinical model (Aij & Raspaniotis, 2017). In other words, just as the counselor wants to inspire the client to achieve success in sobriety, the leader seeks to inspire their followers to achieve their own goals towards the company’s success. In sum, the leader of treatment addiction centers may find servant leadership to be familiar in concept to both herself and her followers. In addition to the protective factors discussed above, several researchers have found relationships that may be helpful for directors and managers of addiction treatment facilities. As part of gathering baseline data for a larger burnout-prevention intervention, Vilardaga et al. (2011) studied mindfulness (relating to their Acceptance Commitment Therapy intervention), values-based processes (actions and thoughts consistent with values), and work-site factors (job control, salary, social support, workload, and tenure) among addiction counselors (n = 699). Using multiple linear regression models, the authors found stronger correlations to burnout in mindfulness and values-based processes as compared to the work-site factors (11% variance increase on average). The study also concluded, with disclaimers, that higher salary levels were predictive of higher exhaustion and depersonalization levels. The findings corroborated literature that suggests the longer a counselor stays in their position, the lower the level of turnover intent. Mindfulness and encouragement or inventory of values-based actions could be helpful constructs for addiction treatment organization leaders to employ with their team. Using data from substance use treatment center administrators gathered in the National Treatment Center Study from 1995-1998, Knudsen, Johnson, and Roman (2003) sought to find management practices that most effectively retain staff members, specifically counselors. Interviews with administrators, clinical directors, and marketing directors were performed first (n not listed) followed by mailed questionnaires to counselors. The authors found three management practices that protect against turnover: providing job autonomy (degree to which respondents believed they had authority to do their job), enabling employees’ creativity, and rewarding employees’ performance, both monetarily and otherwise. Extensive research from Maslach and Leiter (2008) has also been conducted on early predictors and subsequent protective factors of burnout. For example, a good relationship between employer and employee is helpful in resolving occasional problems that, if left unresolved, may contribute to burnout. Thus, a leadership model that values leader-follower relationship, much like authentic leadership or servant leadership, may assist in alleviating early feelings of burnout. Additionally, if an employee has high congruence between their job expectations, which can be characterized in terms of fairness (distribution of resources, rewards, and credit) or values, they are less likely to experience signs of job burnout or turnover intention. It should be noted that a significant amount of time may be needed to move from early problems of job-person incongruence to burnout. Strong leadership from addiction treatment directors and managers is an essential element of combating the current opioid epidemic. It should be the goal of such leaders to empower and support their employees, thus setting up counselors to succeed in their delivery of substance use treatment. A major factor in this support, as evidenced by the bevy of research in healthcare literature, ought to be burnout prevention. As key players like Maslach and Leiter have shown, burnout is a complicated syndrome that should be approached from both the intrapersonal and organizational levels. If directors are to succeed in lowering turnover and maintaining high quality services, a leadership framework that pairs with burnout protective factors, like job-person congruence, should be utilized. It has been demonstrated that servant leadership appears to be one such model in terms of both counselor relatability and leader experience and personality. However, more research is needed to fill the literature gap, especially regarding both employee-perceived and objective fairness. If the proposed model proves to be significant in reducing burnout, addiction treatment leaders and support staff would have a wealth of servant leadership material to utilize. Leadership in Healthcare and Public Health by Trevor Moffitt is licensed under a Creative Commons Attribution 4.0 International License, except where otherwise noted.